Customers have been using Tableau and Google BigQuery to store and analyze large volumes of data for years. As volumes grow and use cases expand, our engineering team is hard at work to ensure that the technologies work together to continue to exceed the demands of our customers. Optimizing the two technologies together will yield significant performance gains, shorten design cycles, and help people and organizations become more successful. In the wake of the latest wave of updates from Google BigQuery, we are excited to share the latest version of the Tableau-Google BigQuery Best Practices whitepaper. The goal of this paper is to impart awareness of techniques to optimize data modeling and query formation to maximize the responsiveness of visualizations. It also discusses techniques to get the best cost efficiency when using Tableau and BigQuery together. This iteration of the whitepaper features a discussion of several new improvements that’ll benefit our customers. Probably the most game-changing one is that BigQuery is moving from BigQuery Language to standard SQL! That’s right, Google BigQuery upgraded its APIs to use standard SQL in addition to BigQuery SQL (now called legacy SQL). And we've upgraded our Google BigQuery connector to support this change and give you a richer analytical experience. Level of Detail calculations: Now you can leverage Level of Detail calculations directly in BigQuery! 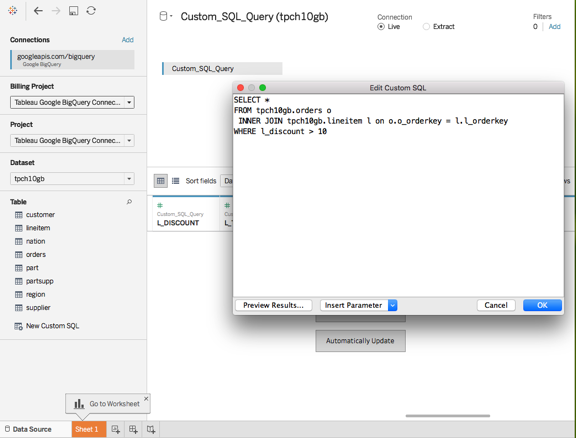 Faster custom SQL: Validating custom SQL could take several minutes depending on the complexity of the sql statement. Google has released new features that allow us to validate custom SQL in seconds! 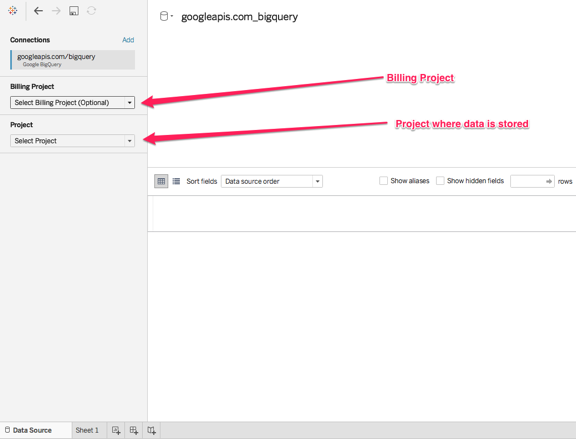 Choice on where to bill your work: After connecting to BigQuery, you have the option to choose which BigQuery project to charge your queries to. This is great if you want to charge database costs of team projects to different departments and programs. To dive deeper into these best practices, download the whitepaper here. And if you’re headed to Google Cloud Next in San Francisco, be sure to stop by the Tableau-Google joint session where we’ll share live demonstrations on how Tableau and GBQ work together to drive value in the cloud. We also invite you to visit us on the expo floor to meet with our team and learn how customers like Spotify and The University of Colorado at Denver are using Tableau on GBQ to generate meaningful impact across the enterprise.